Judge is becoming the embodiment of a three-true-outcome hitter. Aaron Judge is having a fascinating debut season. He’s been an absurdly productive hitter, although much of that production occurred in the first half of the year, when the Yankees rookie hit 30 homers while slashing .329/.448/.691. It was a start that, combined with Judge’s rookie status, screamed regression was coming. And through about a month after the All-Star Break, that regression has hit Judge very hard. He’s hit just .185/.346/.398, and while his OBP is being sustained by a high walk rate, Judge is striking out more than a third of the time. That’s manifested in an ignominious record last night, as Judge struck out in his 33rd consecutive game. Judge smiled when a reporter said he had set the mark, not long after Judge gave a simple “no” when another writer asked if strikeouts bother him. Judge was a little more serious in evaluating his penchant for strikeouts in greater detail. That’s into the third deck at Citi Field, leaving the bat at 117 mph; only Yoenis Cespedes had reached that part of the park prior to Judge’s blast. Judge has essentially personified the cliche of a three-true-outcome hitter; he’s either walking or striking out nearly 50% of his at-bats (over 50% in the second half), and it’s telling that the strikeout record he broke was previously held by Adam Dunn. That’s the type of hitter Judge has been in the second half, after having one of the best offensive first halves to a season in history. 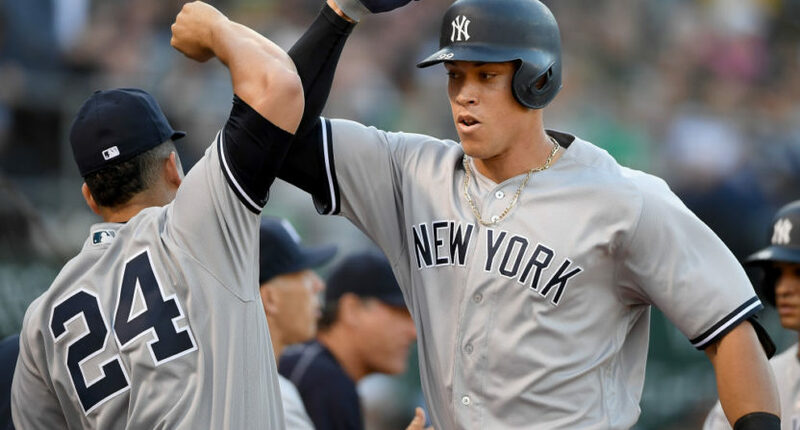 But while that first half pace was always going to slow, Judge is in a place now where it might be fair to expect some positive regression; his walk rate is still there, likely because opposing pitchers remain terrified of giving up triple-deckers, and rookies traditionally go through waxing and waning periods of adjustments. But it’s telling that even in the midst of a record-setting streak of strikeouts, Judge has still been playable, even productive at times. As with everything Aaron Judge-related, it’s an anomaly.